I really enjoyed this children’s book. My sixth-grader was reading it in school and I decided to read it too. 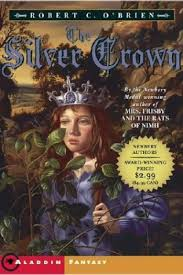 It’s a story of 10-year-old Ellen who, on her birthday, wakes up to find a jeweled crown on her pillow. Before her family wakes up, Ellen puts the crown in her purse and sneaks out of her house to walk to a nearby park. Soon after, she hears sirens and discovers that her house has burned to the ground and her family is nowhere to be found. And thus begins her journey to find her Aunt Sarah and escape the mysterious people who are chasing her. Ellen meets many during her time on the run. Some are good and some are evil. Ellen develops a strong bond with 8-year-old Otto, a young boy living in a house in the woods with an old woman he calls his mother. This book has an edge to it that younger kids’ books don’t. There are frightening characters and scary situations and difficult good-byes between Ellen and the people she meets. Despite these losses, many are turned around at the end. I think this book is perfect for a middle school student. The fantasy element allows the reader to experience danger, fright, bravery and loss, with a comfortable ending. Elsa is having a hard time being different. She’s seven years old, gets beat up at school and her only friend, Granny has just died. Granny was the only person who made Elsa feel safe and important with her fairy tales from the Land-of-Almost-Awake, where battles are fought and heroes are made. Now Elsa feels angry and lost, unsure of what to do with the last thing Granny gave her, a letter and a key to deliver to a mysterious tenant in their building, The Monster. What follows is a story within a fantasy world in which Elsa goes on a treasure hunt, delivering letters to the people in her building and learning more about her grandmother, whose mysterious and demanding career as a surgeon kept her away from home and largely absent from Elsa’s mother’s life. The tenants in the building are equally mysterious and quirky, but they all have a history with Granny, who rubbed many people the wrong way with her nonconformist ways. As Elsa learns more about her neighbors, she begins to see that Granny’s secrets represent many heroic and unselfish acts of kindness, all with a price, however. A threatening enemy also lurks in smoky shadows and Elsa will need all the help she can get from her neighbors. I’m not sure how to categorize this book. In many ways, it seems to be a children’s book, written in a third-person narrative, but with a child’s perspective and wholesome themes of courage, friendship and love. And although the story also deals with more adult themes of death, divorce and loss, most of the plot takes place in the Land-of-Almost-Awake, with characters from Elsa’s real life stepping in and out of that world. I had a little trouble with this structure. As an adult reader, I was less interested in learning about a brand new fantasy land, a little bit like Narnia and with many references to Harry Potter’s world. Six kingdoms with similar names and an abundance of fairy tales and characters made note-taking a tedious requirement. In addition, while the story is mostly fantasy, young Elsa’s improbable precocious character doesn’t fit in the real world. Her vocabulary and insight represent someone way beyond seven (almost eight) years. The author also includes a great deal of repetition, presumed to help the reader understand the characters. Okay, perhaps if it’s a children’s story, but adding unnecessary pages to an already complicated tale. I recommend My Grandmother Asked Me to Tell You She’s Sorry to Harry Potter fans and fantasy readers who like quirky characters and happy endings. I know lots of people loved this book. I struggled with it. What did you think? Do you think book ratings should represent a book reviewer’s personal taste? Columbia professor and mythology expert Theodore Schultz is enjoying a quieter life since his recent run-in with a violent religious cult. As a consultant to the NYPD, Theo had nearly died last summer and now he’s recuperating nicely. And helping him is Selene DiSilva, the striking and powerful beauty he met during the investigation. Selene is mythology’s present-day Artemis. She’s the daughter of Zeus, protector of the innocent and goddess of the hunt, virginity, archery, animals and the moon. While it may sound great to be immortal, Selene and her extended family have found themselves in a strange state. Their godly powers are fading and they are coping with the very human side of aging. Selene is still very tough, however, and she uses her power to protect and avenge. Selene and Theo survived the dangerous adventures in The Immortals. Now they can relax and work on their relationship. As the goddess of virginity, Selene must consider a more modern lifestyle and Theo may be the one to make her change. Modern romance is put on hold, however, when police investigators call Theo to help with a new murder investigation. A man’s body has been discovered on Wall Street’s Charging Bull statue and clues point to another ritualistic cult. When Theo and Selene discover the cult’s evil plot, they rush to decipher the clues before the next murder. Winter of the Gods is Book 2 of Brodsky’s Olympus Bound Series, an imaginative science fiction adventure. In this story, Brodsky’s characters take sides in the battle between good and evil, with a few of them caught in the middle. Within that fight are several layers of conflict between Selene and her family, who are often at odds with each other. Can they work together to fight against an imposing, but unnamed enemy? And does it help or hurt when mortals like Theo get involved? Many characters from The Immortals return, including Selene’s twin brother Paul (Apollo) as well as a couple mortals: Theo’s best friend Gabriela and the story’s sleeper love interest, Ruth Willever. As a fan of mythology, I enjoyed learning many particulars about these imperfect gods and goddesses, their loyalties and their rivalries. Mythology buffs will appreciate the author’s knowledge and her detailed explanations of the Olympians’ complicated family tree. I had fun imagining the gods using their magical weapons and other devices with mortals, including winged helmets and gleaming swords. Brodsky makes the mystery real by placing many New York landmarks in the story, including Wall Street, Rockefeller Center, Roosevelt Island and North Brother Island. A terrific scene takes place at Grossinger’s the now-deserted Catskills resort, shown below. As they decipher clues and gain entry into the cult’s chambers, Theo and Selene race against time to stop the murders, with numerous obstacles. The story ends in a wild finish, with many twists, surprise heroes and a few hints at what may happen in the next book. I recommend Winter of the Gods to readers who like fantasy adventure stories in which characters must pull strength from their innermost reserves to save the day. Who were the Twelve Olympians and what were the Eleusinian Mysteries? Two percent doesn’t seem like much, unless it describes the number of people who inexplicably disappear from earth one day. The official name is the Sudden Departure, but what was it? An apocalypse? The Rapture? In The Leftovers, the stunned citizens of Mapleton, New York are left behind to float and struggle as they adjust to a new emptiness. To restore order, citizen Kevin Garvey becomes Mapleton’s mayor. As he tries to help the town move on with their lives, others, including his wife Laurie, join a cult, the Guilty Remnant. Their vow of silence, chain-smoking and passive aggression unnerve the rest of the town. In a small town defined by normalcy, all comforts go out the window and Kevin’s college age son and teenage daughter veer wildly off course. One of the most interesting characters is Nora Durst, whose entire family vanishes while she is in another room. She suffers to understand and to move forward, just as the others, but I think her pain is the most tangible of all the characters. Without spoiling the story, some of you may not like the open ending. I like it because it allows me to imagine what the characters will do. I also think it ends in a hopeful and positive way. This is a very original story, and good for a book club because it is both heavy and light with plenty of discussion points. 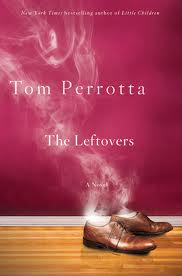 If you want more Leftovers, check out the HBO series of the same name created by Damon Lindelof and Tom Perrotta. Justin Theroux, Amy Brenneman and Liv Tyler star in this creepy dystopian drama. I’m in the middle of a very satisfying binge watch and can’t wait to see what happens next! Lindelof and Perrotta develop strong characters in Season 1 who fall into their own in Season 2. The series is full of strange surprises and anything is possible at the slightest turn. But be warned, if you watch it right before bed, prepare yourself for some strange dreams! Conor O’Malley is tormented by a recurring nightmare, too terrible to speak about. During the day, he pushes it down because he has a lot to deal with in his real life. His mother is dying of cancer and he’s being pushed around at school. At thirteen, he wants to handle it alone. Then a voice calls to him in the dark. It’s not the nightmare. It’s a monster, formed out of a yew tree and it has come to tell Conor that the nightmares won’t stop until he admits the truth, the thing he is the most afraid of. This is the beginning of a dark and serious story about a boy learning how to let go of his dying mother. Here is what will happen, Conor O’Malley. I will come to you again on further nights. And I will tell you three stories. Three tales from when I walked before. And when I have finished my three stories, you will tell me a fourth. Over a period of weeks, the monster visits the boy and tells the stories, each with surprising twists. Meantime, Conor’s daytime life is spiraling. The cancer treatments are not working and Harry at school continues to bully him. When Conor makes desperate and violent efforts to be seen, he hopes being punished will lessen the horrors of his nightmare. But he cannot find relief until he faces the truth. That’s when he can look to the future. Here’s a book that looks like a children’s book, but is more appropriate for a mature young adult and older readers. The story’s serious nature makes it an emotional experience. Although most reviews are overwhelmingly positive, several suggest that A Monster Calls should not be considered a self-help book for kids who have lost a parent. That’s a personal decision. I think the book is excellent. The monster’s fables tie perfectly into Conor’s story and are terrific examples of the contradictory nature of human thought. A great book for older children and adults. Siobhan Dowd was a British writer and activist. She was raised in London by Irish parents and visited Ireland often when she was a girl, developing strong ties her parents’ homeland. Dowd wrote children’s literature, including A Swift Pure Cry, The London Eye Mystery, Bog Child and Solace of the Road. Dowd spent much of her adult life fighting for human rights and was very active in the English and American PEN, a writers’ organization, where she edited a collection of work by imprisoned authors and journalists and led a defense committee for Salman Rushdie. She also felt strongly about protecting children’s rights. Dowd died of breast cancer in 2007. She wrote profusely during her illness and, prior to her death, had developed the outline and characters for A Monster Calls. After she died, Dowd’s editor asked Patrick Ness to write the story. When I was asked if I would consider turning her work into a book, I hesitated. What I wouldn’t do – what I couldn’t do – was write a novel mimicking her voice…But the thing about good ideas is that they grow other ideas. Almost before I could help it, Siobhan’s ideas were suggesting new ones to me, and I began to feel that itch that every writer longs for: the itch to start getting words down, the itch to tell a story. A Monster Calls was made into a movie and will be released in the United States on October 21, 2016. Written by Ness and directed by J.A. Bayona, the film stars Lewis MacDougall as Conor, Liam Neeson as the monster, Felicity Jones as his mum, Tony Kebbell as his dad, and Sigourney Weaver as the grandma. Check out the film here on IMDb.com. When a middle-aged man returns to Sussex, England for a family funeral, a visit to his childhood neighborhood yields no remarkable memories…at first. But then he thinks of the farm down the lane. As he drives down the narrowing lane towards the Hempstock farm, he thinks of Lettie Hempstock and the year he was seven. She was only eleven, but she knew important, mysterious things. With sudden surprising clarity, he recalls how she claimed the duck pond on their farm was really an ocean that carried her family here from long ago and far away. The Ocean at the End of the Lane is a terrific, fast-paced, coming-of-age fantasy tale for adults about all the mysteries of life, death, nature, the past, and the present. It begins with a man’s suicide at the pond and leads to a series of frightening, confusing and painful events. Gaiman includes all the themes I love in a book and tells a scary story in which his characters unknowingly live alongside creatures pretending to be human and fight powerful monsters with supernatural shapes. An alarming struggle between father and son threatens to tip the balance of the young boy’s world and it’s up to Lettie to reverse the damage. I think Gaiman has a remarkable insight into children’s minds, how they think, what frightens them and what makes them brave. He reminds me of all the small things I felt in my ordinary childhood and connects them to a powerful story about good versus evil and our human links to nature, the past, the present and the changing world. A great read, with lots of scary twists and meaningful themes, suspenseful to the very last page. More of an adult book, despite the young characters, but okay for high schoolers. Genre: Fantasy/Thriller/Paranormal, and anything that takes his interest. Books: Kings & Pawns; Angel of Death (Reaper Series book 1); Angel of Vengeance (Reaper Series book 2); Angel of Judgement (Reaper Series book 3); Redemption; City of Crows. Bio: G.P. Burdon is an Australian independent author who writes novels that combine his love of fantasy, thriller, and the paranormal. Burdon wrote and self-published his first thriller novel, Kings & Pawns, then followed it with his popular fantasy trilogy, the Reaper Series. Burdon has recently completed a paranormal thriller titled City of Crows and will soon begin his second book series, Barren, which is a young-adult sci-fi. In addition to his self-published works, Burdon has also had flash-fiction thrillers and horror stories published in several literary magazines and blogs. All of his published works are available through Amazon and Kindle, and book 1 of the Reaper Series is permanently free on Kindle. Favorite thing about being a writer: The ability to be creative in my daily life is definitely my favourite thing about being a writer. Creating complex and unique characters is always fun for me, and writing is the one job I’ve ever had where I was excited to start my day. Biggest challenge as an indie author: The biggest challenge is finding a way to stand out in the crowd. Working with a much smaller budget than “professionally” published authors makes it incredibly hard to market your work in an ever growing sea of independent authors. The trick is getting noticed, but that’s difficult when a million other people are standing beside you, also trying to be noticed. Favorite book: Under the Dome, Stephen King. Are you an indie author? Do you want to build your indie author network? Why not get your name out on Who’s That Indie Author? Email bvitelli2009@gmail.com for a bio template and other details, and follow along on Book Club Mom to join the indie author community! When the mutilated body of Helen Emerson washes up in New York’s Riverside Park, it’s not just the city detectives who are on the case. Selene DiSilva, a striking figure with jet black hair and silver eyes, has a special interest in the crime. A former cop, Selene has made it her mission to protect women against violence and she’s not about to let this murder go unsolved. Clues point to a violent cult ritual and Selene knows she must act before more women become victims. The above description could outline all kinds of murder mysteries, but The Immortals is an altogether different kind of story because Selene is no mortal. She is a modern-day Artemis, daughter of Zeus and Leto and goddess of the hunt, virginity, archery, the moon, and all animals. Selene and her family of gods and goddesses are using aliases and living in New York and around the world. Although they aren’t exactly close, these Greek deities are connected by thousands of years of family dynamics, complicated relationships and rivalries. Imagine carrying around all that family baggage! Selene is drawn deeper into the mystery when she learns that Helen had been obsessively researching papyri fragments found in an ancient Hellenistic city. And shocking details about a second murder convince Selene that the people behind this violence are reenacting the Eleusinian Mysteries, a ten-day ceremony and “the most important religious ritual in ancient Athens and the surrounding area for almost two thousand years.” This connection to the Mysteries will bring Selene’s dysfunctional family together in new ways. While it may sound great to be immortal, Selene and her extended family have found themselves in a strange state. Their godly powers are fading and they are coping with the very human side of aging. Selene’s senses aren’t quite as strong, her strength has diminished and she’s noticed lines and wrinkles in the mirror. Caught somewhere between being mortal and immortal, she wonders if she can do enough. She has help from Professor Theodore Schultz, a classics expert at Columbia. This unlikely duo combine their knowledge and connections to chase after the cult before its next sacrifice. There are plenty of twists, turns and road blocks in this race to stop the hierophant and his followers. Selene and Theo land in a multitude of dangerous situations, complicated by Selene’s sudden and inexplicable strengthening powers. The Immortals is more than an action thriller, however, as its characters navigate through relationships, family issues, university politics, love and forgiveness. Romantic tension torments Selene, who has kept her vow of chastity for thousands of years, a promise that landed her long-ago love, Orion, in the heavens, twinkling down at her. And Selene’s bitter rivalry with her twin brother Paul has modern relevance despite its ancient history. In addition to these sub-plots, Brodsky introduces the interesting conflict between a world shared by gods and mortals and the idea that academics view myths as manmade creations, “not to be taken literally, but to be torn apart and dissected and put back together.” Who’s to say the gods aren’t living among us? In addition, Selene’s character is nicely introduced in this Olympus Bound series. She’s a strong female, but a long-time loner and her lack of social skills can get her into trouble, especially when it comes to romance. I’m looking forward to seeing how this endearing character manages in Book Two – Winter of the Gods. If you liked my review of The Immortals, you may also be interested in these preview posts of Brodsky’s book. I have been on the waitlist to borrow A God in Ruins from the library for months and yesterday, my name came up! I can’t wait to get started! A God in Ruins is a companion book to Life After Life, a great story in which Atkinson explores the “what if” possibilities of her characters’ lives. This is one of the best books I’ve ever read. It is a complicated story that begins with both the birth and death of Ursula Todd and moves in different directions as Ursula’s life is saved or rewritten, leaving the reader to wonder whether we are seeing how fate could have taken different turns or if Ursula herself is somehow able to rewind tragedies and try to get them right the next time. Set in England and beginning in 1910, this story spans both World Wars, but focuses on the period during World War II and the heavy toll it took on Europe. Ursula’s different life paths place her at the center of the German bombings in London for much of the book. In a separate turn of life, she spends time in Germany and twice almost manages to rewrite Adolf Hitler’s fate. To say I loved Life After Life can never fully express how I feel about that book. You can read my full review of it here. A God in Ruins tells the dramatic story of the 20th Century through Ursula’s beloved younger brother Teddy–would-be poet, heroic pilot, husband, father, and grandfather-as he navigates the perils and progress of a rapidly changing world. After all that Teddy endures in battle, his greatest challenge is living in a future he never expected to have. An ingenious and moving exploration of one ordinary man’s path through extraordinary times, A GOD IN RUINS proves once again that Kate Atkinson is one of the finest novelists of our age. Sounds great, doesn’t it? Have you read Life After Life? What about A God in Ruins? Leave a comment and tell me what you think! In current-day Toronto, Arthur Leander suffers a heart attack onstage during a performance of King Lear. Jeevan Chaudhary is in the audience. He’s a former paparazzo, and now an EMT-in-training and he rushes to save Leander. But there’s nothing to be done. Arthur is dead and as the medics wheel him out, Jeevan notices a young actress, Kirsten Raymonde, alone on the stage, watching in fear. That night, a flu pandemic grips the world and takes out 99.9% of its population in a matter of days. Survivors are left in a world without power. No communication, no travel, no internet. Some wander alone, some form communities to protect themselves in dangerous lands. What follows is a series of stories that trace back to Arthur, his life as an actor and his death, the people who knew him and two curious issues of a graphic novel called Station Eleven. These are the elaborate drawings and dialogue created by Arthur’s first wife, Miranda and they describe a damaged space station that’s built like a planet and is hiding deep in space. The planet’s surface is mostly water. Most of its people live trapped in the undersea world, led by Dr. Eleven and all they want to do is go home. 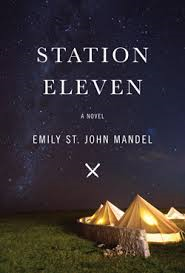 Station Eleven is difficult to describe because it’s the kind of book you just have to read to understand. Mandel describes a post-apocalyptic world in which a dangerous prophet claims that they are the chosen ones and that “everything happens for a reason.” But the story is more than that. It’s a look at people who are forced to change their lives in the most drastic of ways, to build something out of nothing. Some of Mandel’s characters, like Jeevan, have already begun to change. Arthur’s best friend, Clark Thompson, is just beginning to realize how meaningless his job as an expert in changing executives is when the pandemic hits. Kirsten and other younger survivors remember little of their previous lives and do what they need to do. And twenty years later, new parents need to decide what to teach their children. Do they tell them about the world that was? What’s the point? The book jumps around a lot, but Mandel is good at explaining the connections and before long, the jumps become seamless. And of course, they all lead to the ultimate confrontation between the good and the bad, with a satisfying finish. I like all the pieces in this story. They all work, including the parallel story of the lost space station. I like the hopeful suggestion that most people are good and noble and my favorite part of the book is the description of “The Museum of Civilization.” And I especially like how Mandel introduces Arthur at the end of his life, giving the impression of a man who has failed to achieve happiness or to understand the true meaning of life and love, until the end. Is finding peace and understand okay, even if it’s in the last hour of your life? A great read – check it out! Click here for more information about post-apocalyptic books.